Small Red Damselfly (Ceriagrion tenellum). Male. 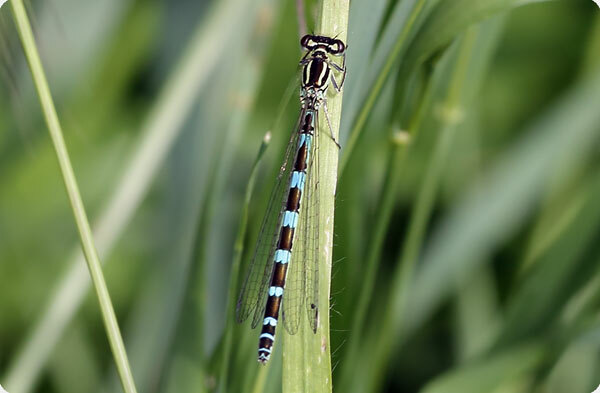 Taken at Cothill Fen, Oxon, on July 14th 2013. Approx 5x lifesize. Male. Taken at Cothill Fen, Oxon, on July 14th 2013. Small Red Damselfly (Ceriagrion tenellum). Female - form typica. Taken at Crockford Stream, Hants, on July 16th 2011. Approx 4.5x lifesize. Female - form typica. Taken at Crockford Stream, Hants, on July 16th 2011. 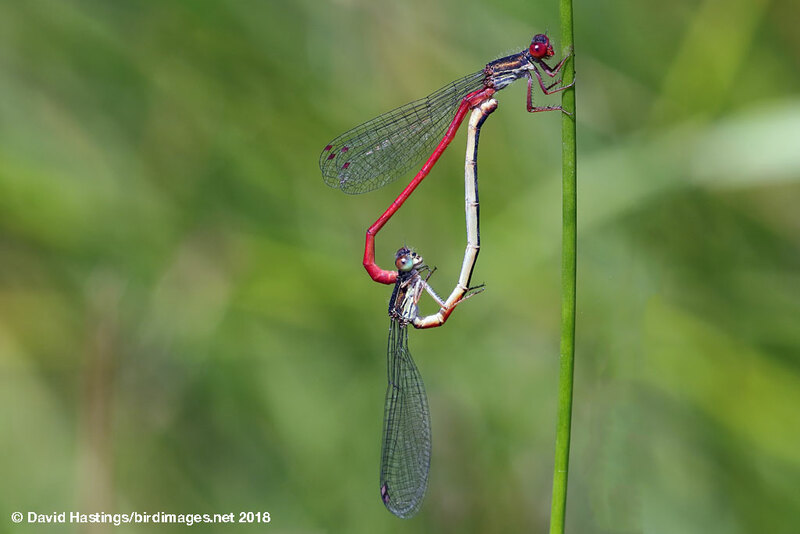 Small Red Damselfly mating wheel (Ceriagrion tenellum). Mating wheel. Taken at Cothill Fen, Oxon., on July 12th 2018. Approx 4x lifesize. Mating wheel. Taken at Cothill Fen, Oxon., on July 12th 2018. A very small damselfly, about 15% smaller than the Large Red Damselfly. This species is easy to identify as the male has an all-red abdomen, reddish legs and pterostigma, and no postocular spots. There are three female colour forms. The most common has a bronze-black abdomen, apart from S1-3 and S9-10 which are mostly red. This species has a very restricted distribution in Britain, being found only in the south and south-west of England, and west Wales. It prefers shallow, relatively warm acidic waters, occuring mainly at pools, seepages and small streams. These are usually associated with heathland bogs. Eggs are laid in submerged vegetation, hatching after about a month. They develop over two years. The flight period is July and August. Adults fly low and weakly, rarely moving far from breeding sites. They can be very inconspicuous.